A windstorm ripped the east fork from an old red oak. At a distance, the tree’s exposed heartwood glowed yellow in autumn’s soft afternoon light. As so often happens, the “Yellow Tree” became a landmark for a post hunter’s wilderness sojourns. Old Northwest Territory, overlooking the River Raisin’s bottom lands in the Year of our Lord, 1798. 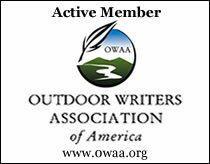 This entry was posted in Scenarios, Snapshot Saturday and tagged Black powder hunting, Dennis Neely, historical trekking, Mountain Man, Native captive, North West trade gun, Northwest trade gun, traditional black powder, traditional black powder hunting, traditional blackpowder hunting, Traditional Woodsman. Bookmark the permalink. I sincerely hope that old tree survives the loss. Having to live in a rapidly growing community I’ve had to witness too many majestic old trees succumb to development, only to be replaced by thin twigs planted in neat rows. I always look forward to your Saturday posts and hope you don’t mind me tagging along vicariously into your time machine. Thank you for the kind words. I’m glad you are enjoying the posts. 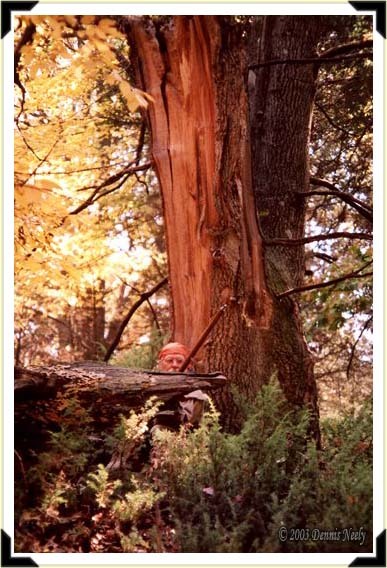 The branch came down around 2002, and I hunted on that tree twice last season. It’s still there, and like all of us, getting older. That’s a tragic irony that few will realize. I encourage everyone I know to “repurpose” any tree that must be removed by either donating it to a local sawmill or bringing at least the trunk to them and having it milled into usable lumber for whatever project they choose. Many of the exotic or imported trees that can no longer be replanted or found in nurseries have, after 50+ years of growing, ended up there and I know of two gun builders who have used them as the foundation for very unique muzzle loaders. Of course, by the very fact of having stocks made from non-native species would never fit in to a historically correct setting but it’s comforting that a majestic tree of any kind could live on showing it’s inner beauty. The best part is that native trees are also being used for other projects instead of just for firewood and I hope one day to be able to build or have built a custom muzzle loader stocked with a species that would have been available here in Texas in the 1820’s. Maybe someday I will find that perfect piece of native black walnut or pecan just waiting to be shaped into something beautiful again. I understand your concern. That branch was split when it hit the ground and thus not salvageable. We try to salvage damaged timber when we can. On the other hand, leaving the downed tree tops provides shelter for the wildlife–and good cover for traditional hunters who need to eat, too. It is a fine line to walk in property management.